With just eight days left until The Punisher premieres on Netflix, the streaming service has unleashed a brief clip to tide fans over before the premiere. The clip is only 15 seconds long, but manages to pack in a lot of action in that short amount of time, with Frank Castle (Jon Bernthal) putting his considerable skills to the test against a local cop. After he easily dispatches the guy, he pulls a unique move that may be an homage to the 1988 action classic Die Hard. This scene takes place in an apartment complex, with Frank taking out two cops at once, before grabbing the fire hose and jumping down into the stairwell, as another cop starts firing at him. It seems that Frank also manages to injure his arm when the fire hose runs out of slack, and it's possible he could have broken his arm, or perhaps aggravated another injury, but whatever the case, he's clearly injured when he hits the ground, but still manages to get out of the way of the other cop's onslaught of bullets. Unfortunately, this clip doesn't offer much context into the scene in question, but it proves once again that this show won't be shying away from violent scenes like this. After exacting revenge on those responsible for the death of his wife and children, Frank Castle (Jon Bernthal) uncovers a conspiracy that runs far deeper than New York's criminal underworld. Now known throughout the city as The Punisher, he must discover the truth about injustices that affect more than his family alone. The series is executive produced by showrunner Steve Lightfoot (Hannibal), Jim Chory (Marvel's Daredevil, Marvel's Jessica Jones, Marvel's Luke Cage) and Jeph Loeb (Marvel's Daredevil, Marvel's Jessica Jones, Marvel's Luke Cage) who also serves as Marvel's Head of Television. Marvel's The Punisher is produced by Marvel Television in association with ABC Studios for Netflix. The Punisher premiere date of November 17 was just released a few weeks ago, which also happens to be the same date that Warner Bros.' DCEU superhero adventure Justice League hits theaters. Jon Bernthal leads a cast that also includes Amber Rose Revah as Dinah Madani, Ben Barnes as Billy Russo, Daniel Webber as Lewis Walcott, Deborah Ann Woll as Karen Page, Ebon Moss-Bachrach as Micro, Jaime Ray Newman as Sarah Lieberman, Jason R. Moore as Curtis Hoyle, Michael Nathanson as Sam Stein, Paul Schulze as Rawlins, Shohreh Aghdashloo as Farah Madani. It was also confirmed by Marvel Television president Jeph Loeb that fans will get to see the Battle Van from The Punisher comic books in action during this first season, but it's unclear how much of this iconic vehicle we'll get to see. 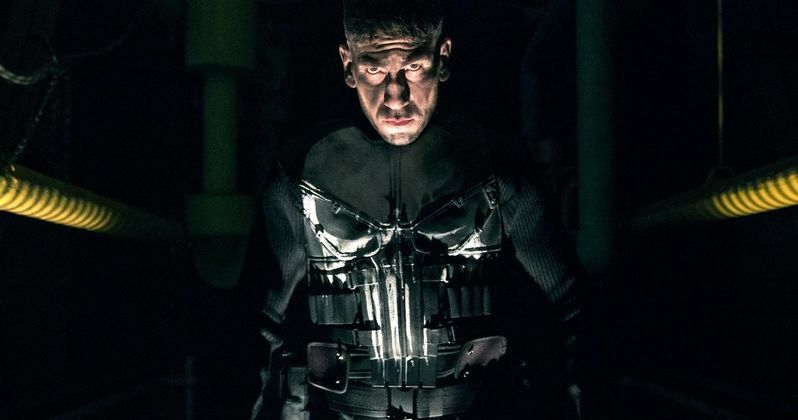 The Punisher was slated to debut new footage at New York Comic Con last month, but Marvel and Netflix decided to pull the show's panel, since it came in the aftermath of the deadly shooting in Las Vegas that left 58 dead and more than 500 injured. Whether or not this tragedy will have any impact on fans watching the show on Netflix remains to be seen, but we'll likely find out more after the show premieres next week on the streaming service. Until then, take a look at the latest clip below, courtesy of The Punisher Twitter.